Extending your property can add a great deal of value to your home, not to mention creating more space for a growing family and a more pleasing environment filled with natural light. Home extensions need to be given careful consideration. Get it wrong and your new space is not just disappointing, but it can damage the light, flow and quality of your existing rooms rather than improving it. The basic concept of many of the homes we live in today is over two hundred years old and in many ways reflects a defunct living habits with smaller rooms and perhaps, most problematic with how we live today, separate kitchens away from the main living space. An extension can be the answer to unite these rooms in your home. But what type of extension is right for your home? 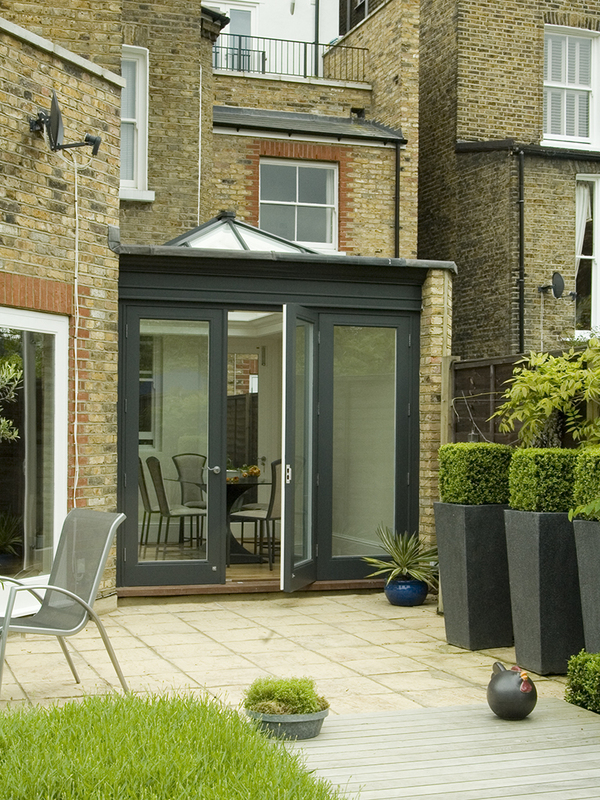 A good starting point is to think about the kind of new space you want from your extension. The three most popular types of single storey extension that Just Roof Lanterns have had the pleasure to work on are: the rear extension, the side return extension and the wrap around extension. A rear extension is one that goes across the width of the property usually from garden wall to garden wall and extends out towards the garden. By extending out you can link existing rooms together and create a bigger, more open space. This type of extension usually offers the most potential to maximise natural light. This project maximising light penetration along the principal elevation via 3m tall bi-fold doors that run the full width of the extension. 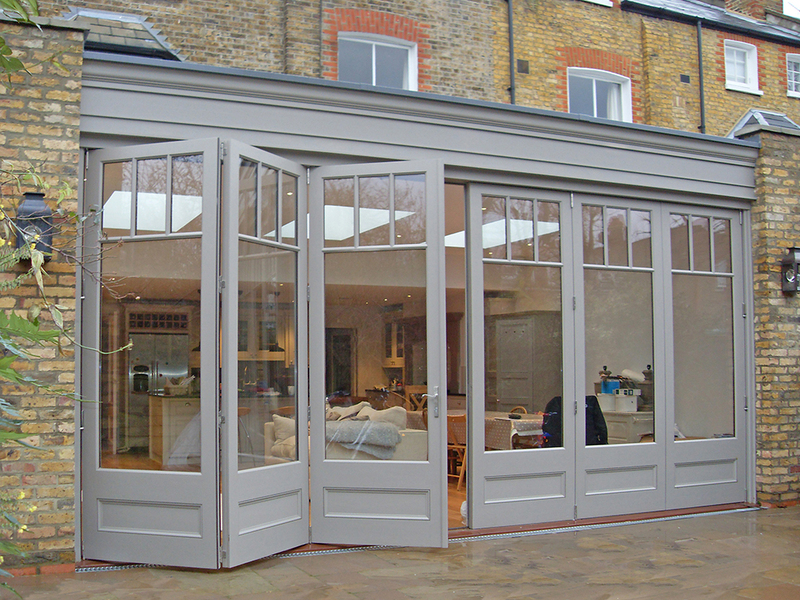 Bi-fold doors paired with a roof lantern above help natural light flood into the space and adjacent rooms. A side return extension makes use of the sometimes awkward space at the side of the rear projection normally found on Victorian and Edwardian homes also traditionally known as the closet wing. Some of these properties also have a small alleyway on the side of the property. Side return extensions can incorporate this alleyway and extend the closet wing to the full width of the property. It’s often the only possible way of extending these types of homes. Squaring off the floor plan to create a larger kitchen dining room is a popular solution. Built as a dining room to be accessed off the sitting room, the entire front elevation of the orangery opens onto the newly landscaped garden via a 3 door set of bi-fold doors. 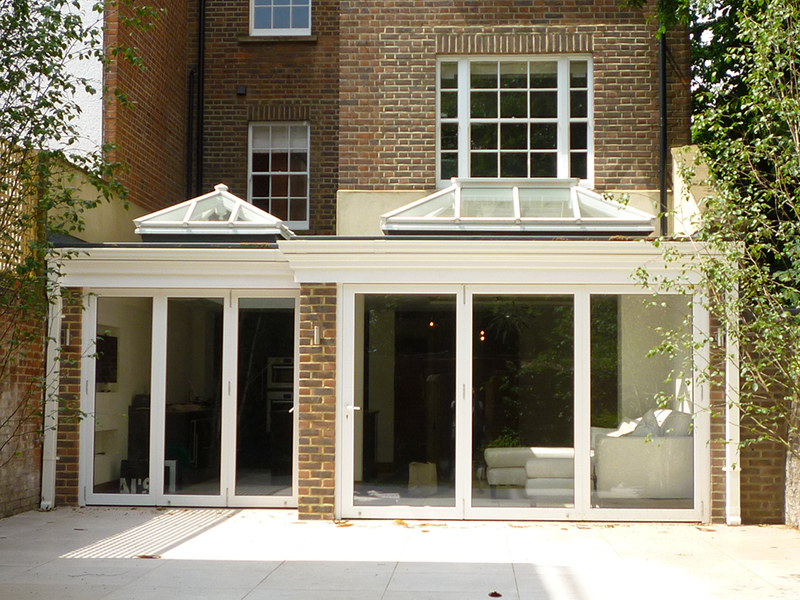 Running the lean-to roof in this orientation enabled the owner to accommodate their much loved existing tall french doors and ensured light still penetrated the adjacent room. This project was designed with wide glazing panels not only to give it a contemporary feel but to maximise light into the new kitchen space and adjacent room. A wrap around extension runs across the side elevation and back of the property and is usually single storey but can be two. Popular wrap around extensions are found on terraced properties where they include the closet wing and extend into rear garden. Thus becoming a combination of both rear and side extension formats. 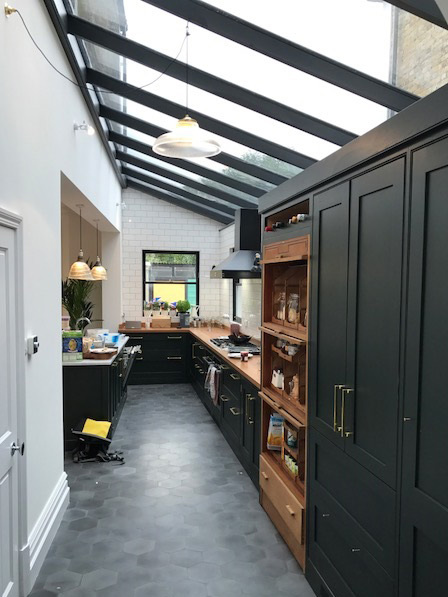 This wrap around extension features three roof lanterns and two sets of bi-fold doors to maximise natural light into an open plan kitchen / dining / living space. 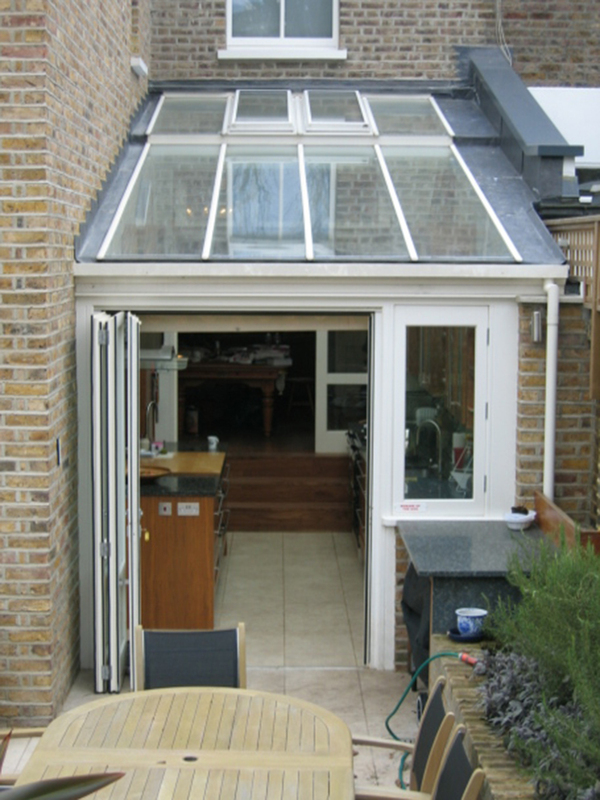 This project on a terrace property features a lean-to on a very narrow side return and a roof lantern across the back. Both specified with opening vents to ensure air flow. Being creative with light from above is critical. With any type of extension when you extend out, the light source from existing rooms in your house will become further away and potentially feel darker. 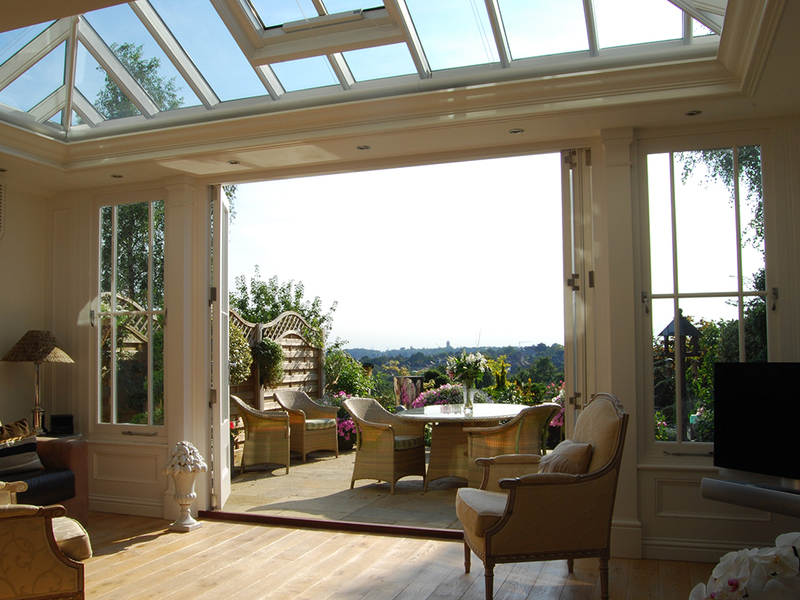 A key element of any successful extension is to allow light not just to the new extension but to these adjacent rooms. Light from above can bring in twice as much daylight as a vertical aperture of the same size as well as penetrating much deeper into the house. More white means more light. It is a generally known fact that light colours make a room look bigger and brighter. Light and bright walls are more reflective, making a space feel open and airy, which helps maximise the effect created by natural light. Dark colours, on the other hand, tend to absorb light, making a room look smaller. If you like dark colours, a good compromise is to specify the roof lantern interior in white to reflect more light back into the space. So many options?! Adding a roof lantern into your home extension not only introduces light but will create extra volume and height, making it feel more dramatic. 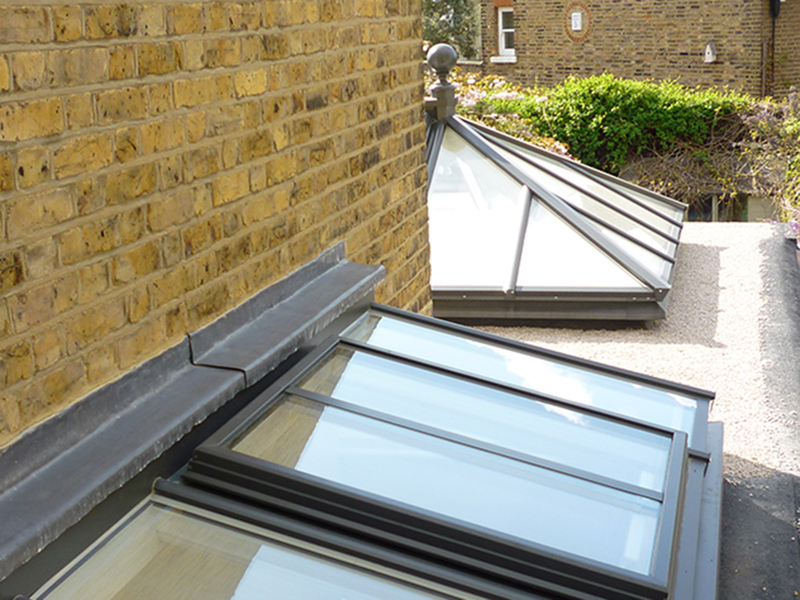 A flat rooflight is ideal if your project if height sensitive or a low profile is required. 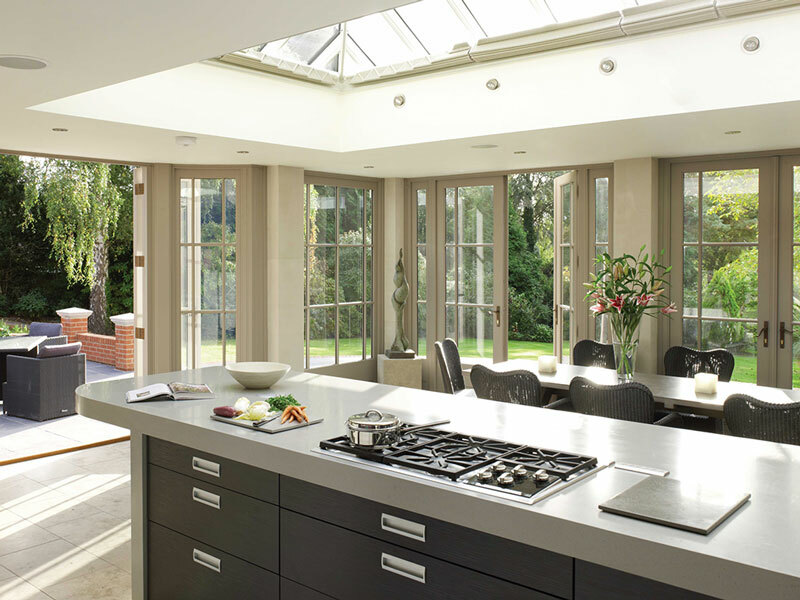 If your extension doesn't lend itself to a glass roof then opting for Bi-fold doors are a great way of opening up the home to the great outdoors and creating a striking indoor/outdoor space. French doors with matching sidelights can be just as striking and can make a space feel less exposed if you’re overlooked by neighbouring properties. The sliding door takes up very little space and is ideally suited for narrow terraces and balconies where making the best use of space is the main concern. Sash windows are a great way to retain the charm and historical character that is synonymous with period homes. Casement windows are very versatile in their configurations and sizes. 'To complement or not to complement, that is the question'. Whether to complement or contrast with the existing house is a further consideration. Both work well and while there are no hard and fast rules don't be afraid to mix contemporary styles with traditional. Here at Just Roof Lanterns we have seen many stunning projects infusing both elements successfully, both externally and internally. 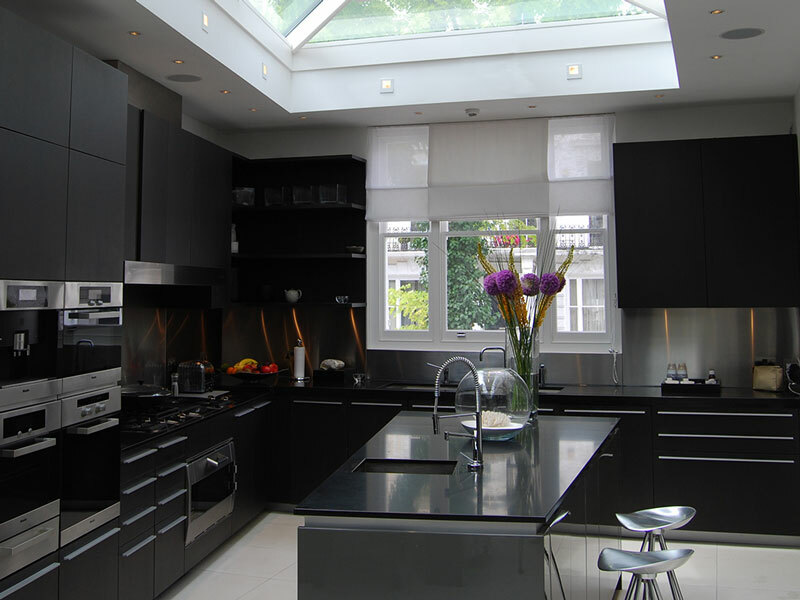 Contemporary 4-pane timber roof lantern blends beautifully with an equally modern black kitchen. Traditional timber roof lantern and joinery paired with a contemporary kitchen / dining room. Ventilate, ventilate, ventilate! Last but in no means least whatever type of extension you choose don't forget about ventilation, especially for a kitchen or dining extension. A roof lantern with opening vents are great for areas like this because you don't always want to open the doors or windows to the unpredictable British weather! They also help steam, heat and cooking smells to quickly escape which creates a more useable and pleasant space for everyone!